Muhammad Ali Jinnah (Urdu: محمد علی جناح‬‎ Audio (help·info), born Mahomedali Jinnahbhai; 25 December 1876 in Karachi – 11 September 1948 in Karachi) wis a lawer, politeecian an statesman, an the foonder o Pakistan. Jinnah is revered in Pakistan as Quaid-i-Azam (Urdu: قائد اعظم‬‎ "Great Leader") an Baba-i-Qaum (بابائے قوم‬ "Father o the Nation"). His birthday is a national haliday thair. 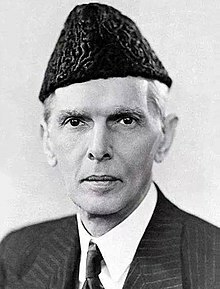 Jinnah servit as leader o the Aw-Indie Muslim League frae 1913 tae Pakistan's unthirldom on 14 August 1947, an as Pakistan's first Govrenor-General frae unthirldom til his daith on 11 September 1948. This page wis last eeditit on 10 November 2018, at 07:32.